We always here about 3D printing and how it can be used to print the latest health innovation. But, thanks to the skills of one individual, he has used 3D printing to print a functioning jet engine. However, when some tech-savvy home-bound genius manages to put his mind together and his building skills as well, some pretty impressive things can come out, like this awesome jet-ish engine that has quite a respectable thrust. 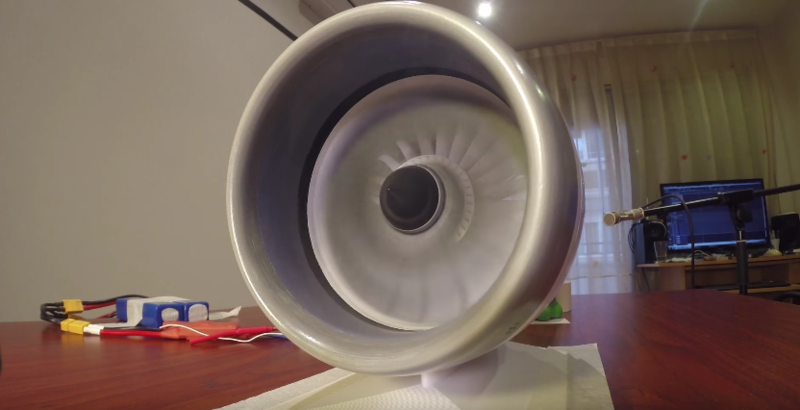 A guy from the RC Groups forum has used a 3D printer to make a fully functional scale model of a Boeing 787 GE-built turbofan jet engine. The user, called Harcoreta, built his replica including over 60 3D printed blades and vanes on the inside, and believe it or not, it manages to produce more than enough thrust to power an RC plane. And that’s exactly why this guy built it for. For even more extreme accuracy, Harcoreta even incorporated a functional thrust reverser into his engine. Impressive enough, he’ll be able to use that reverse thrust to not only stop his plane but have its engine put on reverse before it runs out of runway. Photo credit: YouTube / Screenshot.